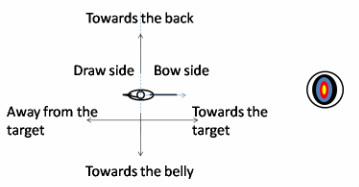 Pre-draw: a light tension is applied on the string, the archer can control if her form is optimal. Depending on the technique used, this may be part of the aiming process. Anchor: the draw hand and the string are fixed (anchored) at a point on the archer’s body. Typical European anchors are at the side of the face or at the neck. Japanese kudo archers draw almost until the ear, which can be seen as an overdraw by European archers.